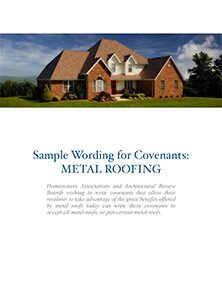 Brands, products, styles and benefits of metal roofing to meet the needs of any Homeowners Association, Condominium Board, or Architectural Review Board are available from Isaiah Industries. Classic Metal Roofing Systems shingles, shakes, tile, and standing seam roofing products beautify and protect fine homes of all types throughout the United States, Canada, and around the world. Classic’s focus is on increasing your property’s value and protection, making your home…or the homes in your community… the worry-free and comfortable investment they should be. Centuries old, yet forever new, metal roofing from Classic Metal Roofing Systems. Learn more about Classic Metal Roofing Systems. Kassel & Irons manufactures environmentally-conscious steel roofs that are stunningly beautiful but also designed for the utmost in protection and durability. Kassel & Irons provides steel roofing for environmentally-conscious property owners. Learn more about Kassel & Irons Steel Roofing. Green American Home’s unique collection of green roofing products offers value, protection, pleasing aesthetics and energy savings for all types of homes. Green American Home is committed to bringing quality and performance to every home in America with energy-saving, maintenance-free metal roofing and insulating, radiant-barriers. Learn more about Green American Home products.